America may just not be ready for the bidet. Or at least, The Real Housewives of New York aren't. Although that little porcelain washer of private parts already has a storied history of being misunderstood and misinterpreted by curious and oblivious Americans, Sonja Morgan of Bravo's hugely popular New York spinoff of the "Real Housewives" series has added a brand new chapter. To catch you up - the ladies are taking a London trip filled with croquet and (somewhat) literary discussions, and in between embarrassing revelations and brutish American familiarity at odds with classic English stiff upper lips, Ms. Sonja Morgan took an early morning trip to the bidet. Just not for the typical reasons. Instead of using the white porcelain bowl for its intended purpose, Sonja took its deceptively sink-like design to heart and decided to dunk her face in it. Decked out in curlers and eyes puffy with sleep, who could blame her? (Other than any European.) And, as a BuddyTV.com episode recap comments, "Her face did look better after withdrawing it from the bidet..." So there's that! While the television-watching public can't count on the worldly smarts of Sonja and Co. to guide them through the hygienic use of European bathroom fixtures (these housewives are only from New York, after all - hardly a bustling metropolis of culture), they can at least turn to the design and décor experts of other reality shows. American bidets aren't yet a lost cause then. They're a functional and eco-friendly part of the modern bathroom. Think how much toilet paper a quick bidet use saves, which in turn helps your toilet flush using even less water! It may just be that the bidet could be the best thing to strike American bathrooms since the hands-free dryer! If you're interested in installing a bidet in your bathroom, don't fear those ancient medieval designs. Most modern bidets come as part of your toilet. 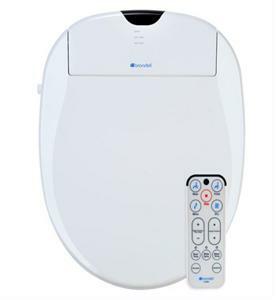 Bidet toilet seat covers are space-saving ways to enjoy the purpose of a classic free-standing bidet replete with modern functions like adjustable water temperatures, specialty air dryers and even deodorizers! Best of all, with a bidet seat, you won't run the risk of guests trying to wash their faces in the wrong bowl.